Oh, December. You’re a cruel and sassy minx. You lure me in with the thoughts of Christmas and time back in Queensland with the family. And then KAPOW! Four weeks of consecutive illness with the cherry on top being laryngitis. Some peeps may be upset about losing their voice but I instead view it as an awesome opportunity to re-record all of my voice mail greetings. I mean, who doesn’t want to sound like a sassy jazz vixen on their phone? Not me! But as always I digress. 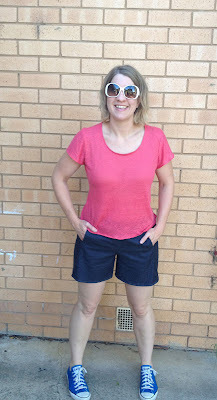 The sewing picking are slim this month but this sickbed seamstress managed to piece together a glorious Grainline Scout Woven Tee and yet another pair of Iris shorts (yes, that is five pairs so far. I’m aware I have a problem). Summer here we come! PDF assembling like a boss. This really didn’t take long to put together and it was easy to follow. Gotta love a Grainline pattern! The neckline. I often have trouble getting shirt necklines to be just right and this just hit things out of the park. No cray-cray shoulder/neck adjustments required. That makes for one happy sewist! Grade the pattern down in the waist and hips. This is a looser fit tee but this just does not work with my shape. I ended up taking in the sides 2 inches each side in the waist and hips to get the fit I like. And that’s it. I love this pattern as it is. Also I don’t like having just a single dot point because it looks lonely so I added this as a point to pad things out. Yup, I fear illness has made me crazy…er. And speaking of crazy… Today is the one year anniversary of my blog. Yay! I wanted to say a huge thank you to everyone who pops buy to check out what is happening in my little cray-cray corner of the internet. Your comments, links and general awesomeness has made this whole learning to sew thing so much fun! Y’all rock. Here’s to an epic new year full of sewing treats, great cheese and cocktails for all! No, Mands, YOU rock! 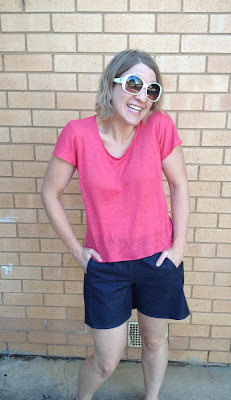 Happy blogiversary and here’s to more crazy(er) sews in 2013. You need to wait another 5 whole years until you can go completely CA-RA-ZY to celebrate B&P properly in the year of the dog tho. Let the countdown begin! Awesome shorts and lovely shirt! That feeling of finding a PERFECT pattern that fits and is easy to make? SCORE! And congrats on your blogiversary! I have also had the monthlong death illness, though I haven’t been nearly as productive as you’ve been. Love, love the t-shirt. Adorable and fabulous – Congratulations on a year of blogging! I always look forward to reading your posts! Happy blogiversary! Here’s to another fabulous year of you in my inbox and I hope you’re feeling better. Loving the tee/shorts combo, such a lovely colour linen for the tee, looks amazing on you. Rad as always Ms Manda. Happy first birthday – may you be a terribly naughty and adorable two year old! Delicious deep rose pink of the most perfect hue? Polka dot lining in the shorts? You’ve hit my two sweet spots. Sickbed sewing has paid off – can’t get over how well that pink suits you! Congrats on the one year, from one Virgo to another! Thanks, Juliet! You need to get on the linen jersey fabric wagon. It’s rad! Merci, Miss Pops! Polka dots are becoming a weakness of mine! Happy blogiversary, girlfriend! Love this Scout tee on you… now you’re making me want a new one! Love it! Love the outfit, especially the polkadots and happy blogversary! Happy one year!! My one year was this month as well. Hard to believe it’s been a year already. Thanks, Ginge! Give in to the tee… You know you want to! Thanks, Suze! 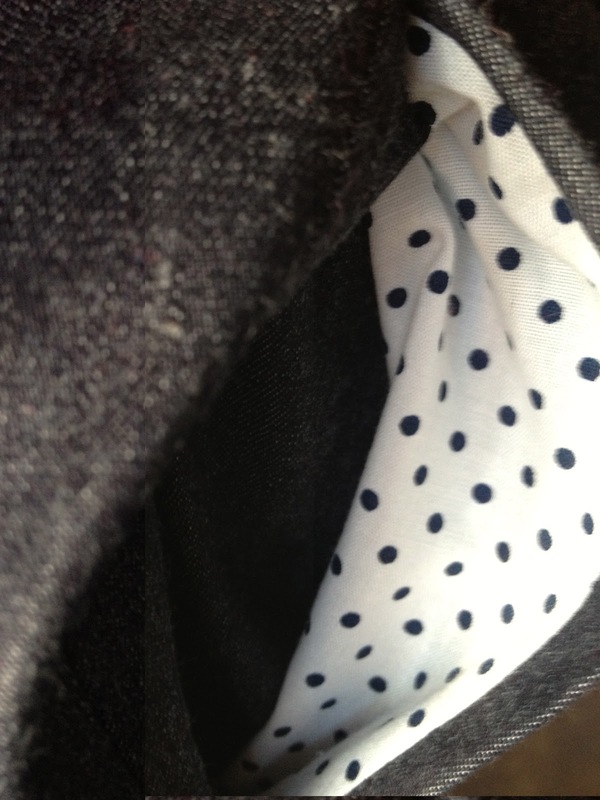 My new mantra is everything can be improved by polka dots! Thanks, Zoe and happy new year to you too! I’m pretty sure that’s the best post-one-month-of-sickbed photo set ever. That shirt color looks brilliant on you! I’m also totally with you on the one bullet point thing…it drives me crazy! Happiest of blogiversaries to you, and I’m so glad to have discovered your blog! Thanks, Mela! Pink is the new black in my world! I’m so glad someone else gets the solo bullet point issue, Cindy! And thank you 😀 It’s been a rad year! I was thinking of getting the pattern for the Iris shorts – I like yours – I may just have to order them now! Your blog makes me laugh! Have loved reading it the last month or so. ah, another lover of the scout tee! that’s a great color and i’m sure you’re going to get so much wear out of it. and i love the polka dot iris lining! I discover you and I take my hat off to you … This blog is full of fun, crazy and good projects … I love everything! I’m sorry you’ve been feeling sick, but you look terrific in your new Tshirt! Oh I’m so late to the party. Have all the cheese and pineapples on sticks been eaten? Congratulations on a wonderful year of sewing!! 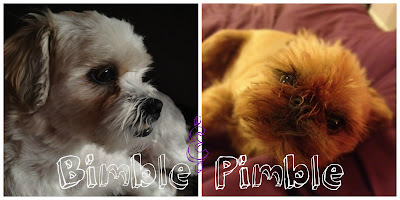 It’s always great to see the eponymous Bimble and Pimble in a post too! Thank you, lovely! The fur kids get a bit cross when they’re not featured in a while. 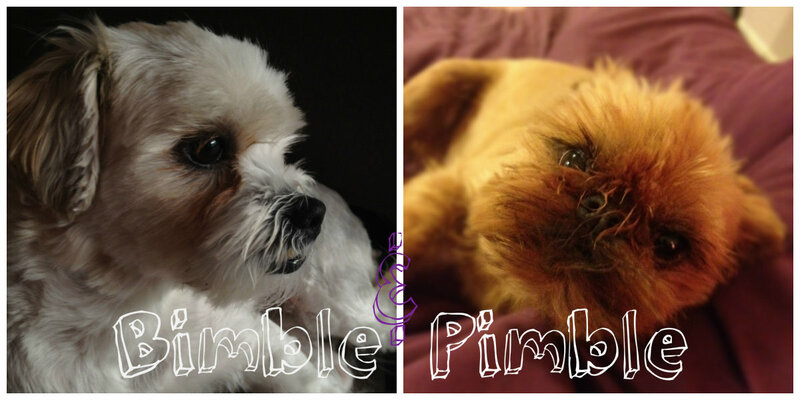 I should get some pics of them wit their summer haircuts and share. It’s too cute!